Hi, and welcome to Aqua Paisley Studio! 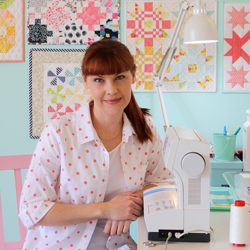 My name is Samantha and I am a designer and quilt maker living in the picturesque Adelaide Hills of South Australia with my husband and three of my four children (with the missing child currently in South Africa serving as a missionary). Like so many others, I made my first quilt not long after the birth of my first child. Within the next few years I made many quilts and loved every minute of the process. 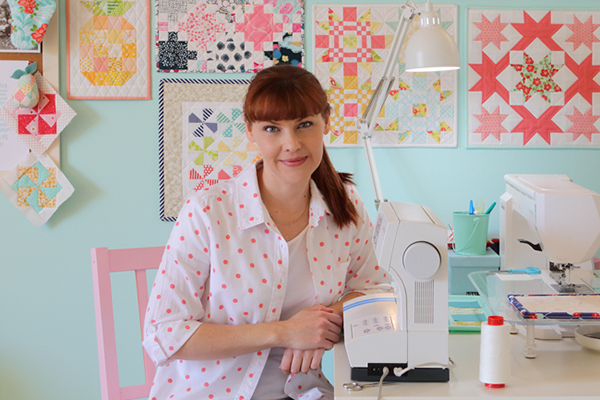 In fact it was the lessons I learnt as a new quilter that helped me understand the fundamentals of creativity and ignited my desire to become a creative professional. Over the past 20 years I have worked in creative fields such as photography, writing, marketing, teaching and interior design. All of these roles have been inspired by my family, our values and my love of home! I am embarrassed to say that for 10 years I channelled my creative energy into career building design projects, which sadly left me no energy for quilt making! But as is often the way, a series of events occurred in 2013 that saw me start to piece together four quilts to give to my children that year for Christmas. Timing is everything and these quilts were a little bit of serendipity! It was a particularly stressful time in my professional life and this quilting therapy reminded me of my authentic voice and made me feel whole and in control of my creative choices. I knew while piecing together those quilts that there was another creative path meant for me. It was about 6 months later that I left the 9-5 workforce to create a life that supported my growing family and my creative goals. In early 2014 I began interacting with the quilting community and sharing on the Instagram platform. Being inspired daily by talented quilters throughout the world has meant that not a day goes by that I don’t think about colour, pattern, scale, proportion and all the wonderful elements associated with the world of design and quilt making. It wasn’t long before I started doodling fabric designs in my sketch book, experimenting with block design and dreaming of ways I could financially support my family as a quilter. Being exposed to creativity in so many different forms over the years has meant that I have developed an appreciation for the process, and I love learning about creativity and sharing my knowledge as much as I actually love to BE creative. From the moment I began brainstorming the type of business I wanted to develop, and the brand I wanted to cultivate, I knew I wanted to focus on the WHY as much as the HOW. If you have purchased one of my patterns you will know that I like to punctuate the step by step format with practical and creative tips and insights, and as importantly ‘the story behind the quilt’, because I truly believe there is value in sharing the creative process and connecting our makes to the narrative of our life. When designing quilts my goal is to share pieces of my everyday life by interpreting classic blocks in a modern way. My particular style is a nod to timeless design and playing with colour. My construction methods are uncomplicated to ensure that no matter what your skill level you will feel successful making an APS pattern. There is no such thing as being ‘naturally creative’, it is something that must be cultivated and nurtured if it is to grow and Aqua Paisley Studio online is where I hope to share my story, nurture my own authentic voice, explore new creative possibilities and inspire others to do the same. Behind the scenes you may find me making endless lists, stretching on my yoga mat, dreaming of ways to rearrange my furniture, and hanging never ending loads of laundry out to dry. I am the ultimate homebody which my dog Oliver is ever grateful for! Thank you for taking the time to visit – I hope you find value in visiting this site! If you have a story to share or a creative idea you think I might like to explore please contact me, I would love to hear from you.